JOINT BASE LANGLEY-EUSTIS, Va. — Faced with escalating aggression from Russia and China, the Pentagon is planning to increase its use of drones by about 50 percent over the next several years. The Pentagon decided to add Army and civilian-operated missions to the mix because the Air Force, which had been running about 65 combat air patrol missions a day, asked to decrease that number to 60 to reduce stress on the force. But 60 patrols don’t come close to meeting the demands of top military commanders facing growing security threats around the world. Senior U.S. officials said that while drones have been used largely to target terrorists and collect intelligence over combat zones, those needs may shift in the coming years. Top military leaders, including the incoming chairman of the Joint Chiefs of Staff, Gen. Joseph Dunford, have named Russia as the nation’s most serious security threat. And China’s rising military power and island-building program in the South China Sea have increased tensions and prompted a greater demand for U.S. surveillance and intelligence across the Pacific. One senior defense official said Pentagon leaders are taking those security challenges into account as they decide how armed and unarmed drones will be used across Europe and the Pacific. The officials spoke on condition of anonymity because they weren’t authorized to discuss the issue publicly. Pentagon leaders have been wrestling with the problem for some time, as the need for more airstrikes and surveillance by drones over Iraq and Syria to battle the Islamic State group offsets a decline in unmanned flights over Afghanistan as the war there winds down. Under the plans laid out by senior defense officials, the Air Force would continue to provide 60 daily drone missions, while the Army would conduct about 16, and U.S. Special Operations Command and civilian contractors would do up to 10 each. The civilian contractors would fly surveillance drones, not the armed aircraft. But senior defense officials said they need at least a small contractor contribution in order to reach the total of 90 combat air patrols per day. The key unanswered questions, however, are how the Pentagon will pay for the additional patrols and how the military will sort out and analyze the growing torrent of data pouring in. Officials said some of the costs could be borne by war funding — the overseas contingency operations in a separate account approved by Congress. The account funded some of the wars in Iraq and Afghanistan as well as some counterterrorism operations in the Middle East and Africa. The use of the Army and contractor flights will give the Air Force time to recover and rebuild its drone staffing. Over the past decade, the Air Force had to very quickly expand the number of unmanned flights over Iraq and Afghanistan. To do that, it made fighter pilots switch to unmanned Predator and Reaper drones, and moved trainers into operations missions. As a result, the Air Force has trained about 180 air crew members per year, far short of the goal of 300. Harris and other military leaders thought that the demand for drones would dip as the wars in Iraq and Afghanistan waned. But the renewed conflict in Iraq, the fighting in Syria, the terror threat in North Africa, the Russian invasion of Ukraine’s Crimea region and the simmering tensions in the Pacific have only increased commanders’ appetite for drones. 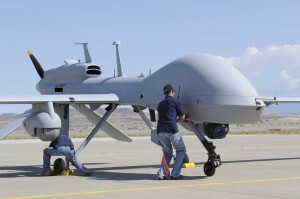 To relieve the burden on the Air Force, the military has already begun using Army Gray Eagle drones in Afghanistan and could expand to other regions as required. But, as the missions increase, the amount of video and other data being funneled to analysts will also spike. Officials said they are working on ways to filter the data more efficiently so that key intelligence is identified and gets to the right people.